French glass painter. He was probably a pupil of Nicolas Macadr. Gontier headed a busy workshop in Troyes in which his three sons, Linard Gontier the Younger, Nicolas Gontier and Jean Gontier were active. His creations are celebrated for their versatility: the rich, deep hues of religious compositions attained through a mastery of the enamelling technique, and the minutely detailed but ambitious secular scenes. He is recorded as having produced a treatise (lost by the 18th century), which demonstrates his commitment to technique. His better known sacred works were executed for Troyes Cathedral - Credo, 1606; Mystical Wine Press, 1625; Life of St Peter, 1639 (the Immaculate Conception and the Martyrdom of St Stephen, 1624, were transferred there from St Etienne, Troyes)  and for St Martin-ès-Vignes (Life of the Virgin, 1620-25). His civic commissions are exemplified by some 45 extant panels (1620-25; Troyes, Bibliothèque Municipale) from the Hôtel de lArquebuse, Troyes. Crisply depicted, the last eulogize the French monarchy and the allegiance of the gunsmiths to Louis XIII. Some of the preparatory drawings survive, including two in Troyes (Muse Historique de Troyes et de la Champagne), and two for the Battle of Ivry and Henry IV Handing his Crown to his Son in Pau (Chteau), which correspond in size to the respective windows. 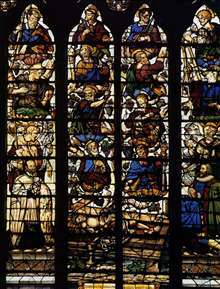 The Gontiers, who often based their compositions on engravings by Albrecht Drer, Domenico del Barbiere, Gerard de Jode I, Nicolas Bollery and others, were the last glass painters of stature in Troyes. See more details about "The Mystical Wine Press "